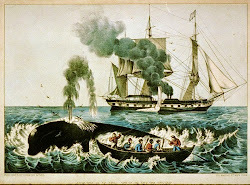 Solomon Ward, born about 1820, was among the many Unkechaug men who went to sea on the long distance whaling expeditions that took them around the tip of South America into the Pacific and on north to the cold Arctic waters in search of sperm whales. Solomon and two other Unkechaugs, Philip and Jessie Smith, signed on the ship Konohassett in 1844. Solomon was the ship’s steward, Philip was a seaman, and Jessie was the cook. The Konohassett, a 426 ton ship owned by Huntting Cooper of East Hampton, was captained by T.B. Worth of Bridgehampton. Captain Worth kept a detailed journal of the expedition that served as the basis for a newspaper account many years later. The account is now in the archives of the Southampton Historical Society. Captain Worth, a resourceful man to say the least, ordered his crew to begin building a small sloop out of the wreckage on the Konohassett. The next day the crew rescued tools, planks, pitch, nails, and sailcloth and set to work. They labored for three wleeks, said Worth, “under every inconvenience. Had but one auger…two axes and very few other tools.” Among the crew were four men with the skills or knowledge vital to the construction of the sloop. Solomon Ward, as the ship’s steward, knew what tools were available and where to look among the wreckage for the necessary materials. These tools and materials were put to good use by Charles Hubbard, the ship’s cooper, Henry Hildreth, the ship’s carpenter, and Thomas Wood, the ship’s blacksmith. Finally, on June 20th they completed a fast sailing sloop they named the Konohassett Jr. Now came a very difficult decision for Captain Worth. The sloop had room for seven men, twenty-eight would have to be left behind with the promise that he would return and rescue them. The captain does not tell us how the seven were chosen. Those left behind were a diverse group, including two of the ship’s officers, one of whom was second mate, T.J. Worth, a member of the captain’s family. The Konohassett Jr. took thirty-eight days to reach Honolulu. The trip, described in an account by James S. Horton, one of the seven men selected for the crew, was “fraught with all kinds of dangers, difficulties and privations, owing to the small size of the sloop and the scanty allowance of bread and water.” Captain Worth, good to his word, outfitted a schooner named the Haalilio and returned to Lisianski to rescue the rest of the crew and to bring them to Honolulu. Unfortunately we have no account of the men stranded on the tiny island for at least two months. Solomon and the other Unkechaugs, who grew up in a maritime environment, may have used their traditional skills to procure food for the crew. They came from families that relied on fish, fowl, and turtle meat to supplement their diet. Captain Worth took passage on a ship and landed in New London in the following spring, but we do not know how or when the Unkechaug men got back to Poospatuck. We do know that Solomon Ward returned to become an active participant in Unkechaug community life. It would be no surprise if none of the Konohassett survivors ever set foot on a ship again. In 1874 when Chief Jacob Ward called for people to support his petition requesting a school at Poospatuck, Solomon was among the signatories. John A. Strong is Professor Emeritus of History and American Studies at Long Island University. He is the author of numerous publications, including The Unkechaug Indians of Eastern Long Island, The Montaukett Indians of Eastern Long Island, Algonquian Peoples of Long Island from Earliest Times to 1700, and “We Are Still Here!”: The Algonquian Peoples of Long Island Today. He recently served as an expert witness in the federal court case Gristedes Foods v. Poospatuck (Unkechaug) Nation.